What is a clip stat and why should I create them? Clip stats enable you to select a portion of your video and see summary data for that specific section. It gives you acceleration data, which includes maximum and minimum acceleration, change in speed, time spent accelerating, speed gain, and speed drop. 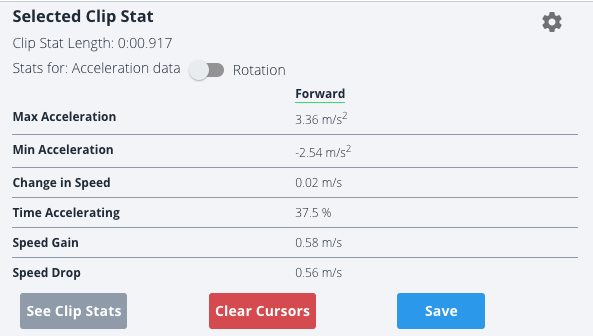 You can also turn on the toggle to see rotation data, including max clockwise rotation speed, max counter clockwise rotation speed, and change in angle. By creating clip stats, you are able to highlight a specific movement, or skill, analyze where speed is gained or lost, and find precisely where improvements can be made. Clip stats can be saved every time you create them, so you can review them later or track technique changes over time. To learn how to create clip stats, check out this post.